The Temple Fade, otherwise known as the Blow Out, Low Fade or Brooklyn Fade is a hairstyle that first became popular between 2003-2005. Hair is faded from the skin to 8-10 mm in length from the lower hedge of the hair line tapering straight up 2 cm (3/4 of an inch) or in an inverted triangular shape from the ear. In 2013-14 the style featured prominently on reality TV show Jersey Shore, a style worn frequently by Pauly D, with a temple fade / Blow Out back to hard product filled spikes. The success of the show led to increased interest in the Blow Out, and the hairstyle enjoyed renewed popularity particularly in Baltimore, Detroit, Cleveland and in its native north east coast of the USA. The style is particularly popular among Italian and South Asian Americans. Spikes on top are not compulsory or even recommended – the temple fade can be transitioned from skin, taking up most of the side in increasing length, to almost any style on top. 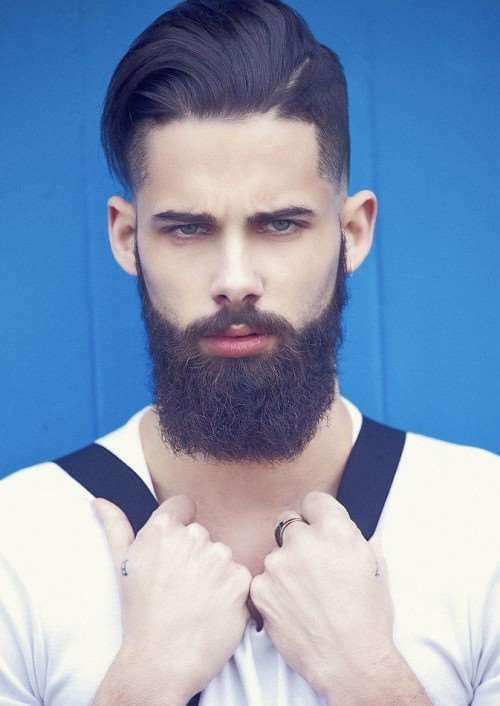 It looks great clean shaven or worn with a beard as worn by model Jimmy Launay in a comb over type temple fade, below. The important thing to keep in mind is that what you wish to achieve on the sides, i.e. the temple fade, does not lock you into any particular choice of what hairstyle to wear on top. You can go for the ‘Pauly D style’ on top, a comb over with hard part, long hair, a pomp, it works with any style on top, and any style of facial hair.